Uncharted 2 is four weeks from completion and, thanks to those of you who played the game's June beta, the development team from Naughty Dog learned a couple of things. Adding a jet-ski level was not one of them. Sony was showing its full holiday line-up for PS3 and PSP in New York yesterday, including a hands-off demo of Uncharted 2's single-player campaign. 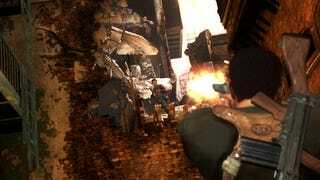 The level, set in a town amid the Himalayas, was previously shown by Sony at E3 and even back in New York in the winter. Seeing something polished but familiar, I sought news about Naughty Dog's anticipated action-adventure sequel. The multiplayer beta for the game wrapped up in June, and Sony producer Caley Roberts told me yesterday that the approximately 5000 players who registered to participate influenced some elements of the game's gunplay. Players used a rifle called the FAL too much at close quarters even though it was made to be an effective long-range weapon. So the single-player campaign was tweaked to better teach how best to wield that gun. The AK-47 in the beta proved not to be accurate enough, so, Roberts said, the developers "need to tune up" its accuracy. Aside from beta lessons learned, Roberts wasn't able to reveal much else about Uncharted 2 that Kotaku hasn't already covered. Sony is keeping most of the game's levels secret for a while more, opting to reveal less of this title in advance than the company did for the first Uncharted. Roberts did say he likes the story of the new game a little better than that of the first and that there are many levels he'd love to talk about. But he can't. Those are the rules. Roberts did confirm some omissions though that probably won't break fans' hearts. Sixaxis motion control, which was used to steady hero Nathan Drake as he walked across log-bridges, is not returning to the sequel. And Drake won't drive any vehicles in this game, though there will be some on-rails vehicle missions. None of them will take place on a jet ski, the clumsy vehicle of some of Uncharted's few criticized low points. Development studio Naughty Dog will be working on the game for four more weeks. After that, it's off to disc manufacturing and into stores for a mid-October release, exclusive to the PlayStation 3.